This post is sponsored by Fresh Wave®. Pawsitively Pets only shares information we feel is relevant to our readers. All thoughts and opinions expressed here are our own. Life stinks sometimes. I mean literally. Living with one dog, two cats, two kids, and a boyfriend, I have a lot of stinky stuff going on around here. I try my best to keep my home smelling fresh and clean, but there are times when odors get out of hand. One product I've recently been introduced to for fighting odors in my home is Fresh Wave®. 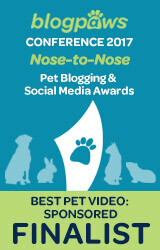 Back in June, I was fortunate enough to attend the BlogPaws conference. 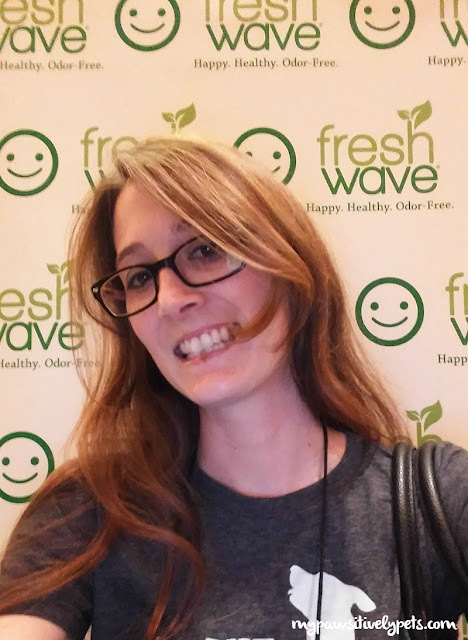 During the conference, I visited the Fresh Wave booth because I had heard of them before but wanted to smell some Fresh Wave for myself. Let me start by saying that all of the Fresh Wave products that I've had the pleasure of sniffing smell amazing! Their scent is not your usual air freshener smell. It's very different from that. Fresh Wave makes natural odor removing products that use simple, pure, and natural ingredients such as water and natural extracts of lime, pine needle, aniseed, clove, and cedarwood. The natural ingredients are sourced from all over the world, but Fresh Wave products are manufactured in the United States. Fresh Wave is safe to use around pets and kids. So What Does Fresh Wave Smell Like and Does It Work? 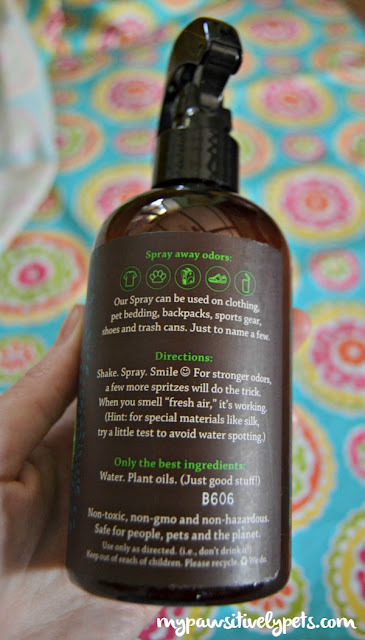 As I mentioned above, Fresh Wave products do not smell like your typical air fresheners. It's hard for me to describe perfectly, but to me Fresh Wave smells minty, crisp, fresh, and natural. You'll just have to smell Fresh Wave for yourself to see what I mean. You can find Fresh Wave natural odor removing products at Target. Here's a handy store locator you can use to find some Fresh Wave near you. Hanging out with Fresh Wave at BlogPaws. And the question you're all probably asking by now - does Fresh Wave work? In my opinion, yes it does. 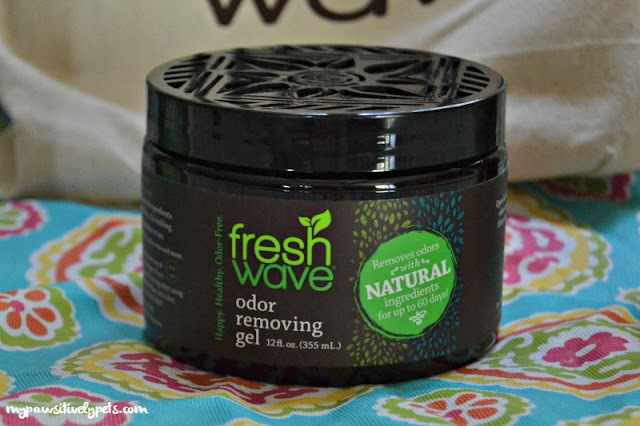 I've tried three of Fresh Wave's most popular products and love them all so far. They've helped a lot with keeping pet odors and other smells at bay around here. Inside this container is a clear gel substance. Just place the container of odor removing gel in an area that you'd like to freshen up. I have a 7 oz. Fresh Wave Odor Removing Gel in between my kitchen and above my kitten's litter box area. The gel has been out for almost 3 weeks and still works well. I imagine that it will be all gone in the next week or two. Luckily, Fresh Wave sells Odor Removing Gel refills. I love this stuff. Any time I feel like an area of my home needs some freshening up, I use the Fresh Wave Odor Removing Spray. I've spritzed on my couches, around the trash can, on the carpet... everywhere for the most part. You can spray it in the air or on water-safe fabrics to remove odors immediately and naturally. These small pouches pack a big punch in the way of odor removal. Fresh Wave Odor Removing Packs are made to eliminate odors in small spaces like trash cans, diaper pails, and gym bags. One of the stinkiest things in my house is the trash can. I threw a pack in there and it's really helped cut back on the smell. Fresh Wave Odor Removing Packs last for 30-60 days. 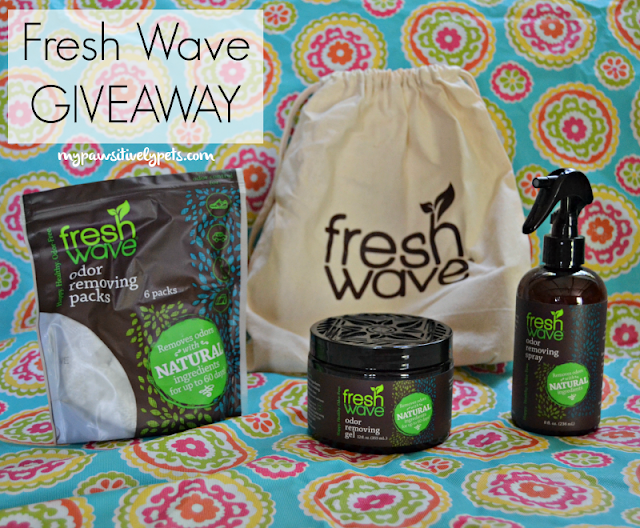 If you'd like to give Fresh Wave in your home, we are having a giveaway! One winner will receive a Fresh Wave Kit (as pictured) that includes Fresh Wave's gel, spray and packs. This giveaway is open to US residents only (void where prohibited by law), ages 18+. You can enter using the Rafflecopter form below until August 14th, 2016 midnight CT. Good luck! Always needs a little freshening up around here especially after it rains! My hound's crate smells like dog! I've never had this problem with my pittie, but after adopting our hound, I'm forever vacuuming and lighting candles. Thanks! I used my sample in the litter closet and loved it! I would like this kit for use around the litter boxes. My dogs like to go out and roll in stinky stuff! Not always sure what it is, and we have had some urine accidents that smell. As you say this makes odors go away. I use it all around my house too. Thanks for the giveaway. That sounds really good and useful too! I love Fresh Wave! Ever since we did a review for them, I've had some in the house. 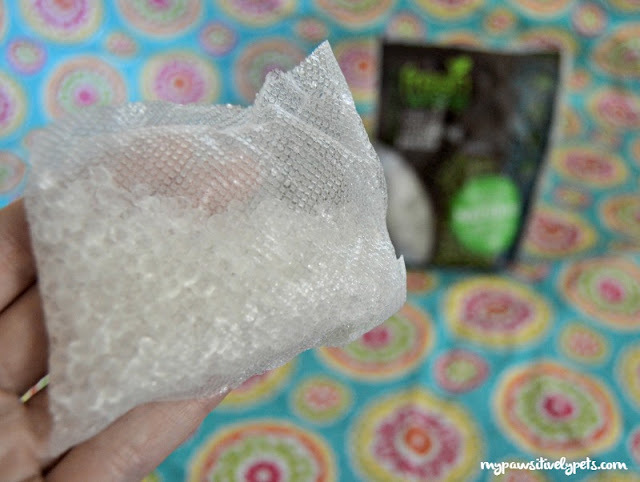 I love the gel packs to put in the trash cans, and I keep a canister in each bathroom. They last a long time too, though I do need to order some more now! We love Freshwave...and were lucky enough to do a review a while back. It's great for our litterbox room. What kind of smell do these give off? Is it a clean-like smell? My senior cat misses the litterbox so i need to remove her urine and my daughter could use it for her guinea pigs. We have a cat (litter box) and a new puppy that is slow in house training. Would love to try this! Fresh Wave sounds like some awesome stuff. We bet it could help in some of the less ventilated rooms at PAWS! Well, with three rescued Treeing Walker Coonhounds and three cats (also rescues, and with one being a kitten just learning to use the litter box), you can imagine we have smells to deal with. Then there's cooking and other smells. I will definitely give it a try. I trust your, and i think if you shared it with us, it definitely deserves a try. Thank you. I have doggie and kitty odors so need to freshen house up. 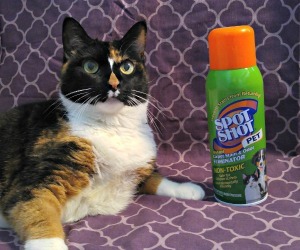 I would like to eliminate pet and food odors. With multiple rescued dogs and cats I would never run out of odors to eliminate, but I would especially love to try it in my cats' litter box areas. After losing a dog to cancer we try to use less harmful chemicals in the home, especially around the pets and pet areas. 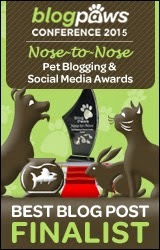 We picked up some of their odor removing gel at BlogPaws and have been very impressed. We put it in the basement near our litter boxes and it has made a big difference. We will definitely be getting it again! 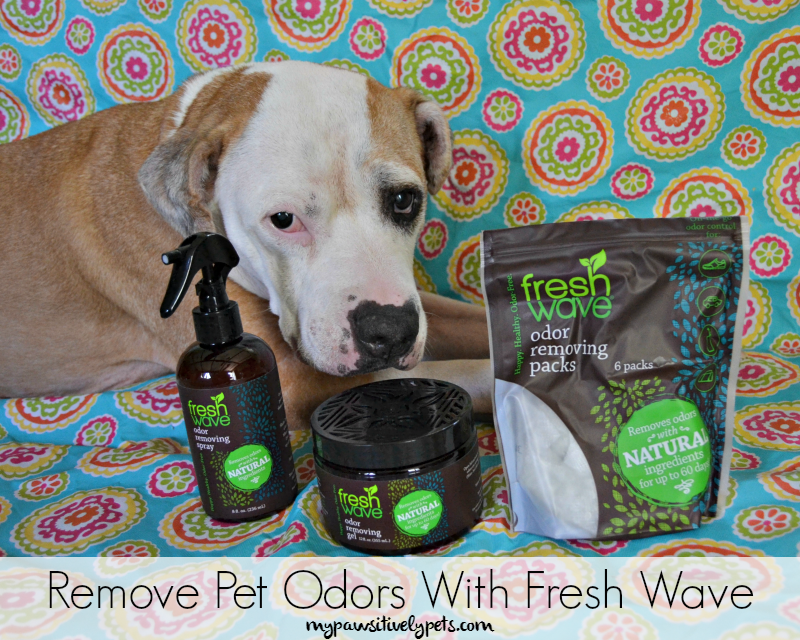 I would definitely use Fresh Wave to eliminate my cat littter box odors. I would like to address the smell of ALL THE DOG FARTS! SO many farts, so little time. Would love to get rid of the dog smell! Now I laugh, 5 hrs cleaning today, I've been fighting an RA flame up after a car accident so 6 cats enough said. And, I love cleaning up after them. Would love help removing odor from the litter box, garbage can and my teenagers room! !